Architectural Acoustics as a scientific discipline emerged parallel to the advent of Modernism in architecture as well as of objectivity in the material sciences. The emergence of means and methods by which the performance of sounds could be measured, predicted and controlled, changed not only the ways by which houses, apartment buildings and workspaces were constructed, but also the ways in which they were perceived. Interior climates, including the auditory environment, became commodified and an individual choice. This condition however required that interior spaces were acoustically insulated and isolated from their surroundings. The hypothesis of this presentation is that these insulated spatial configurations have their roots in the practice of acoustic laboratory tests. 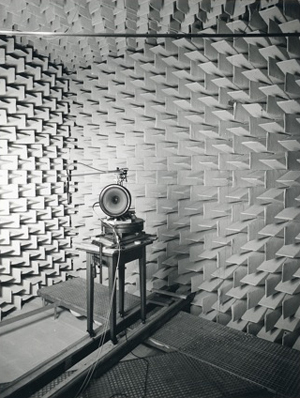 At the same time, loudspeaker techniques as developed in the electro-acoustic laboratories laid the basis for reconnecting these isolated spaces. These practices of insulating and again linking interior spaces eventually overturned the modernist paradigm of transparency and set the basis for capsule-like spaces where sound is a private and intimate matter, personalized and subject to a momentary mood – as opposed to the idea of space as static and timeless. In this presentation, drawing on examples from the history of architecture, von Fischer positions the concept of resonant space of the early acoustical laboratories alongside the concept of electro-acoustically amplified space as it emerged since the post-war period.